Jenga is a pretty popular game nowadays. It’s simple and challenging, allowing you to play anywhere you are, alone or with friends, at the party or at home. It’s comprehensible for kids, letting them develop their skills, abilities and strategic thinking. The game is thrilling for adult people of all ages, providing them with an opportunity to come together more frequently, communicate, laugh and relax, using imagination.It’s not too sophisticated as you need only a set of wooden blocks to build a tower and ruin it by a single move. You can easily paint on them, write down various questions and phrases. It’s possible to apply the classic rules or invent your own ones. Meanwhile, to have this set at hand or present it to somebody as a gift, select the best edition. Nowadays, the game is marketed by the legendary Hasbro Inc. Company that is the famous toy manufacturer. 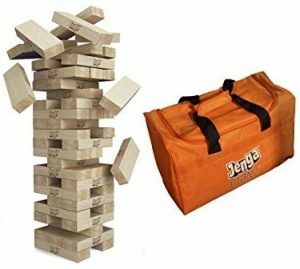 Quite naturally, the bundles are offered under the Jenga brand, being distributed by the similarly-named boutique shop. 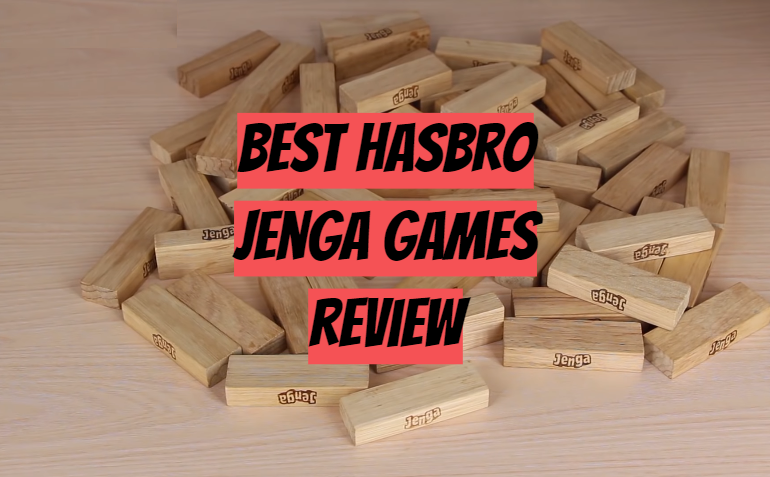 So, do you think that all Hasbro Jenga sets are the same? Not at all. Let me review and compare the 8 genuine items that differ by dimensions, materials and accessories available, as well as the players’ ages. If you need the unordinary outdoor activities, this set is the most suitable. It consists of 54 really large, 7.13” * 2.38” * 1.38”, genuine hardwood, heavy-weight, polished wooden blocks. Using them, you can build a wooden tower up to 5-ft height. Thus it’s great for outdoor parties, picnics and events. Additionally, a heavy-weight and huge, carry & transport bad is included in the package, so you can take the game along easily anywhere you go. 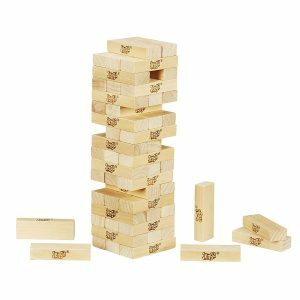 However, the Hasbro Jenga XL blocks are too giant to play indoors, and not suitable for the children that are younger than 12. Some items may be not even, not uniform, and DIY sanding or polishing them would be a good practice. Commonly, the game is highly recommended for students and all people that stay young at heart. great for traveling and camping parties or events. expensive. If you are going to play in a backyard with your kids and guests, this top-quality set is a perfect option. It includes 54 over-sized (6” *2” *1.2) hardwood blocks, instructions and a cardboard stacking sleeve (a sturdy box) for the tiles storing. You can stack the tiles up to 4-ft high building and enjoy the game. However, no carry bag is available, the set is not the best for traveling, but it’s recommended for backyard parties and events. large and top-quality blocks; the box is not too reliable. The set is very similar to the previous one. 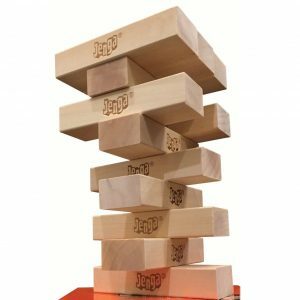 It consists of 54, over-sized (6” * 2” * 1.2”) Hasbro Jenga XL, genuine wooden blocks, allowing you to stack a wooden tower or building up to 4-ft high. It is recommended for adults and kids older than 8 y.o. By comparison, the only difference is the availability of the branded, orange, large carry bag with comfortable handles. The price is also much higher. Meanwhile, the bundle is well-suited for backyard parties and dinners, playing in the patio with friends, as well as for camping, traveling and outdoor barbeques. The tiles are quite durable to be used at rainy weather, but when they get wet, it’s recommended to store them indoors. Additionally, the wooden blocks are perfectly sanded, sliding easily. So, the set is recommended to be presented to kids as a gift. pretty slippery; not the largest possible blocks. I guess, these blocks are the smallest from the Giant Jenga game series, but still considered to be oversized. Their dimensions are 5.7” * 1.9” * 1”, and they can be stacked into an up to 3-ft high wooden tower. Fortunately, the bundle is suitable for younger, 6-9 y.o. 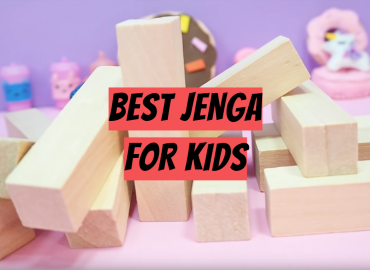 children, and it’s a fun to play Jenga as a family, indoors or outdoors. The game set is beneficially safe and portable, but including no carry bag, only a cardboard box to store the tiles. It’s still suitable for outdoor parties. Drunk people would love it, as well. As to the size, I think, it’s too small for the price, but it may be preferable for indoor activities and children’s’ pastimes. safe and durable; a bit overpriced for the size. When you are having a party on the beach or a celebration, the superior-quality tiles would be quite opportune. Well, the kit is pretty expensive, however, it’s definitely better than sanding the surface by yourself, and the tactile feeling is pretty good. The 54 blocks are beneficially made of hard wood, durable and hard-wearing. 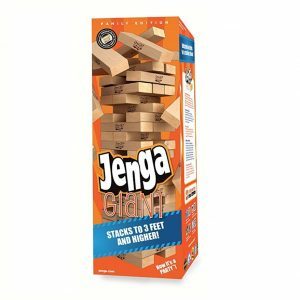 Their size is 6” * 2” * 1”, that is 7 times larger than classic Jenga components, and only a bit smaller than the over-sized items. 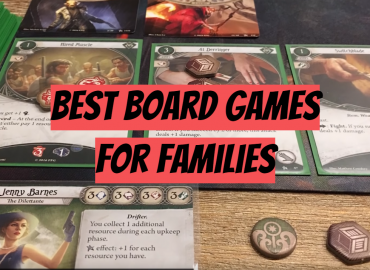 The game is recommended for adults and for teenagers older than 10, and it can become a good, exclusive gift for your college, boss or work-giver. unique tiles’ dimensions. high price. Have you ever dreamed about stacking a really huge tower? If 54 over-sized wooden tiles are not sufficient for you, add 12 wooden blocks more and let your building reach up to the sky. The game would become more difficult, but more exciting in this case! The tiles dimensions are 6*2*1.2 inches. Please, pay your attention, as they are compatible only to the over-sized Jenga version. The quality is corresponding. The price is quite beneficial. It would be only not enough space for the booster pack in the orange carry bag. However, a plain brown box is available, and anyway, that’s something. The booster pack is recommended for the same age as the large tiles set: adults and children older than 8. 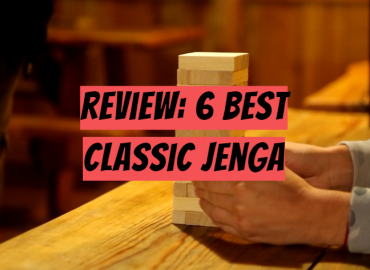 Meanwhile, it would be essential for the real Jenga enthusiasts and fans that aim at perfection. compatible with the over-sized Giant set; common incompatibility issues (it’s difficult to select the accessories that match the available set). great for family parties and celebrations. high price. Quite naturally, the originally-sized Jenga tiles are the most popular. These small, handy wooden blocks are really timeless. The 54 items are solid and durable, made of the genuine hardwood. The exemplary items are initially designed to play indoors, at home, on a table or stand. They are the safest, being lightweight and unable to damage any surface, falling down. The blocks’ dimensions are 0.59” * 0.98” * 3” and even the small kids older than 6 can play and enjoy the game. affordable; design of the box is not traditional. suitable for playing indoors; high price. When you need to select a gift for somebody special, this game kit is pretty suitable. Quite naturally, it includes 54 hardwood blocks, but top-quality, perfectly polished and stamped with copper foil. The tiles dimensions are not huge, similar to the classic ones: 0.5” * 1” * 3”, only a trifle smaller, if we compare the tiles. Meanwhile, the accessories are unique. They include a thick, transparent base and a heavy-duty, elegant box. 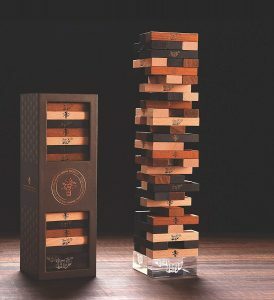 Both the base and the box are engraved with the original Jenga logo, so it would be a really fantastical gift. stamped wooden blocks’ surface; black tiles’ surface is not completely smooth. 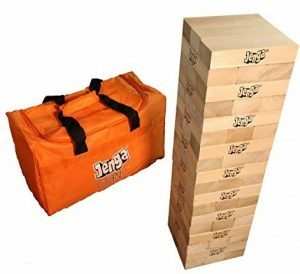 A Jenga game is always desirable, as it gives you a lot of fun. Additionally, it’s intuitive to use, having no age restrictions or any complications for beginners. You just need some luck and to be patient; the tower building skills are improved when you get experience. It determines the game application (indoors or outdoors, traveling or backyard), the future wooden tower height and level, possibility to play with kids. The genuine hard wood is a premium material, as it ensures the best durability, playability and tactile feelings. The accessories are important when you are traveling or going to make an outstanding gift. If would recommend you to read some customers’ reviews to understand the assemblies’ applications and the level of the variously-aged gamers’ satisfaction. Finally, the price matters when you purchase a game for our own, family needs, so, the fairly-priced products are preferable. 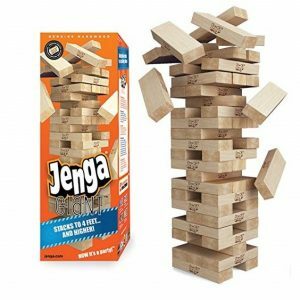 I guess, the best Hasbro Jenga game is the traditional Classic one. It’s lightweight, safe, affordable and versatile, suitable for everybody and all occasions. An over-sized bundle of tiles with a carry bag is preferable for camping and BBQ parties. A premium assembly is great to present as a gift. 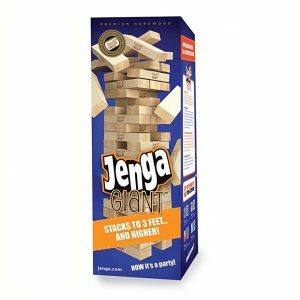 Feel yourself as an architect and adventurer, keeping the balance of the created masterpiece, and then as a desperate sapper, holding your breath rearrange the bar in the tower… Win, learn, meet new people in our Jenga club, and set new records with other participants! 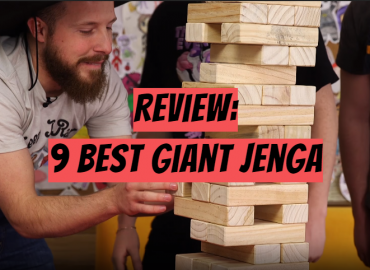 9 Best Giant Jenga in 2019. Which Jenga Game to Choose? 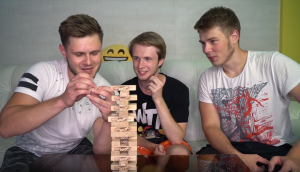 Do you like Jenga? Follow our newsletter!